I first saw this post on Instagram from Reese Witherspoon but she had reposted it from another celebrity who I now forget. While I think it's great that 'Darlene' has connected with friends and family through social media, I think this whole comment is so thought provoking, it really struck a cord in me. 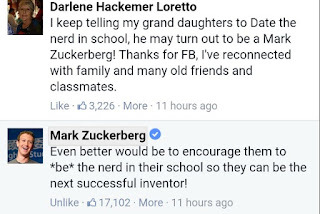 The fact that a grandmother is telling her grandchildren to date a so called 'nerd' because they may one day become rich and famous is absolutely terrible. You should date the guy you like, the person who makes you smile and the man who makes you smile. You shouldn't date because someone tells you to but you especially shouldn't because of their wealth and fame, let alone the mere prospect of it. I hate that people think this way and this is why people are now so scared to love for love because you never know when people are doing it for the right reasons. 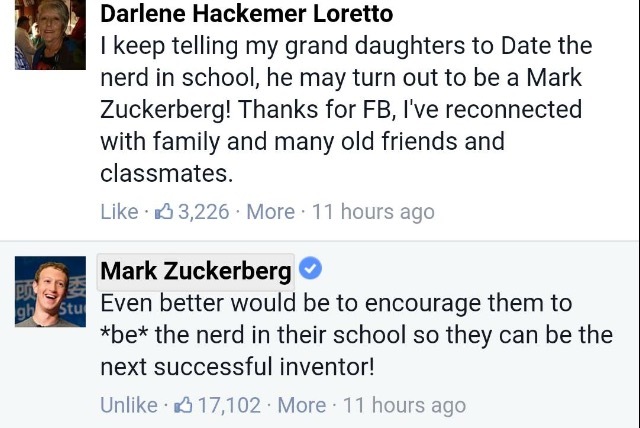 I think Mark Zuckerberg is an amazing guy. After all that he's done and doing, he still comments back to the millions of people who write to him. While he obviously doesn't have the time to read them all, I think it's great that he takes his free time to respond to some. This is the right way of thinking. Not only is he showing what success is but encouraging others to follow in similar paths. Granted, I don't think the grandmother meant the comment to sound the way it did but I do think it shows something that the world needs to change about the way the vast majority think. I couldn't help but think of one of my favourite quotes: 'Be the change you want to see in the world'. If you think something should be changed, change it yourself; don't sit back and wait for someone else to think of the solution.